With many DIY projects, I know just enough to have an unjustified confidence and not enough to know that I’m screwing something up. I had started installing the playhouse shingles based on my own recollections of how much exposure each shingle was supposed to get. You have to keep in mind that I’ve never installed a cedar roof before, so these memories might have been based on something I read years ago. Long enough ago that I had forgotten the important parts. When I was about 1/3 of the way through the roof, I noticed that the back of the tag had some instructions that just had to be wrong, since they didn’t agree with what I was doing. They said that each shingle should get no more than 5″ of exposure, but I was setting them with 7 1/2″. Given that they are about 15-16″ long, that meant the difference between 2 layers and 3 layers. Since I was careful about my seams and nail spacing, I convinced myself that it just wasn’t necessary to go so overkill on a playhouse. And besides, who wants to spend more on cedar shingles than they absolutely have to? The partial roof had already gone through several rains without incident, so I wasn’t too concerned. Well after getting much more of the roof done today and checking on it after a rain, I now realize I screwed up. 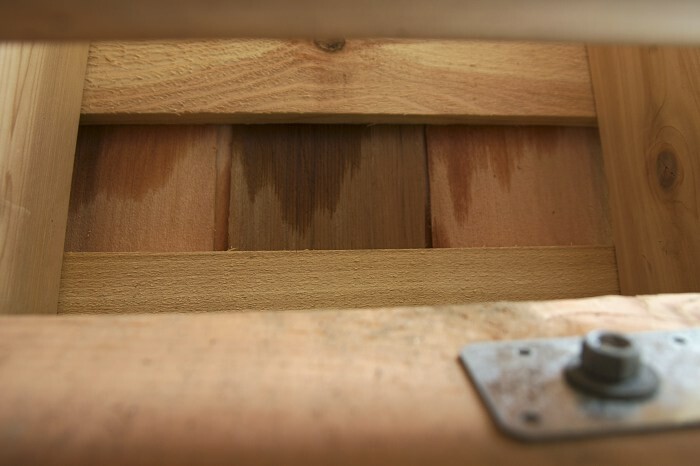 While there are no active leaks, the problem is actually water soaking through the shingles, causing a bunch of them to look like the picture below. I think this will eventually lead to real leaks, so my plan now is to start pulling up nails and resetting shingles at the correct 5″ spacing. Not fun all all, but better to do it now than rip it apart or replace it later!